Poet Dorothy Parker once said, “Summer makes me drowsy. Autumn makes me sing….” When heat affects you this way, fall is a welcome reprieve from the lethargy of long, sultry summer days. Cooling autumn temperatures often boost our energy and renew our enthusiasm for gardening. Wise gardeners turn their thoughts toward preparing their hardworking flowerbeds for their upcoming winter slumber. A good place to begin this process is by plucking up any newcomers that have cropped up since you last weeded. Pull weeds when the ground is wet and keep a pointed sharp object close by to loosen the soil at the root. Grab the main stem as low to the ground as possible and pull it upward sharply. Then dispose of plucked weeds carefully. Take special care with weeds that have flowers or seeds on them. Don’t lay them directly on the ground, shake them or carry them around or you might inadvertently re-seed your flower beds. Also avoid the tendency to toss them in the compost pile; normal composting will not kill seeds. Beware of toxic plants and protect yourself with long sleeves and pants as well as gardening gloves. Poison Ivy, Oak and Sumac all have small white, tan, cream or yellow berries in the fall which can help distinguish them from harmless but similar plants (see photos). 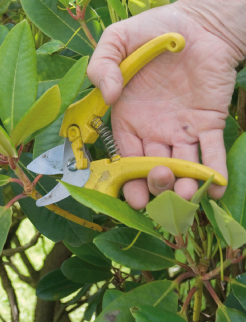 for the next flowering season; pruning now will interfere with this process. Consider too that perennials with prominent seed heads such as Echinacea and Black-Eyed Susans, will provide food for finches and similar birds through the winter if they are not cut back. Think of pruning at this time of the year as a cosmetic treatment. Clean things up by removing spent annuals and any dead or decaying areas of your shrubs, ornamental grasses and trees so harmful insects can’t spend the winter hiding out there. The nutritional needs of grass, flowers, shrubs and trees are type-specific and vary depending on many factors. The appropriate fertilizers should be chosen accordingly and applied as directed. 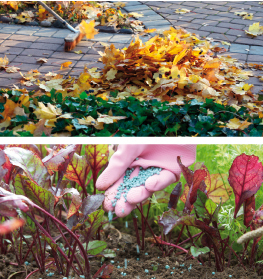 Fertilizing (like pruning) promotes growth and should therefore be done only at certain times of the year. Martha at Rainfrost says to stop fertilizing the plants in the flowerbeds in early September, when plants are preparing to go dormant. This is an ideal time to amend and enrich the soil in the flowerbeds. Compost is a mixture of various decaying organic substances that is used to fertilize soil. Dead leaves are abundant this time of year and are one of nature’s best soil conditioners. Large plastic “hand extenders” called leaf scoops make light work of picking up leaves and other debris. Electric shredders are great for mulching up huge piles of dead leaves but the job can also be done with simply a weed eater and a metal garbage can. Spread a light layer of leaf mulch in your flowerbeds, taking care not to create mounds at the base of trees, shrubs or plants (doing so might restrict airflow and trap water than can cause decay). Add a light layer of old, crumbly horse manure. Top this mixture with a final layer of grass clippings to hold the other layers in place so the microbes can do their composting undisturbed. NOTE: If you add compost only to specific areas of the flowerbeds, work it into the soil before mulching. If you apply compost across the ground in your flowerbeds, you can forgo mulching until Spring. 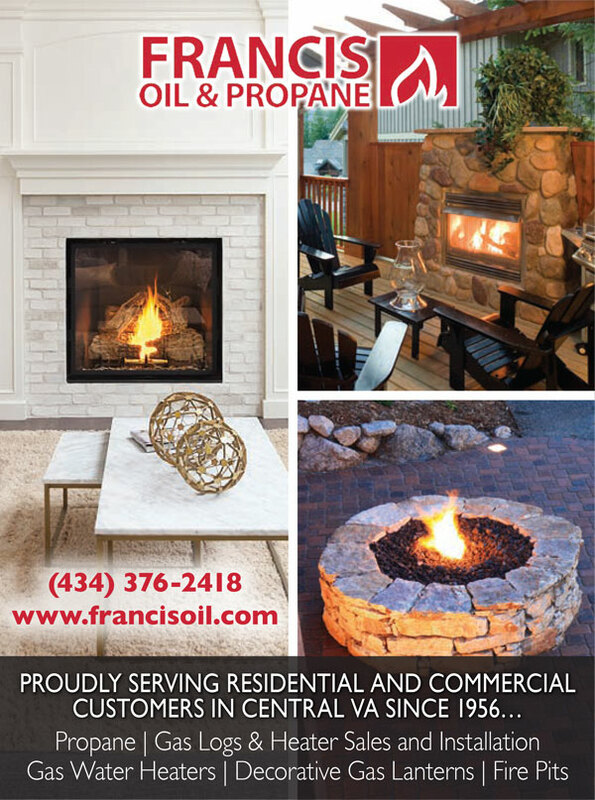 Finally, continue to water your flower beds until the ground freezes to prepare flowerbeds for the winter. Adding approximately one inch of water every week in the form of one deep watering will provide the plants with the water they need to survive through winter. 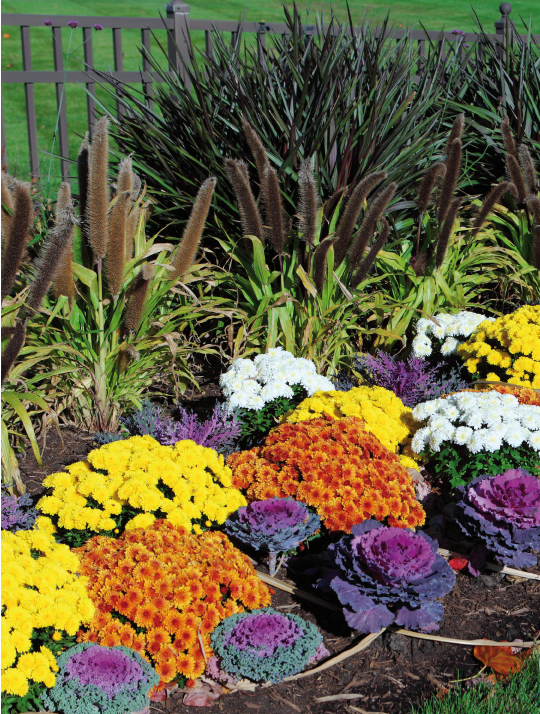 After following these relatively simple preparations, your flowerbeds can rest easy this winter as they dream about emerging next spring.